Introduction to Photography Course-Feathers, Hoofs & Beaks! I have always loved photography, from a young age. Both the technical aspects and the artistic side of the practice fascinate me. I teach A-Level Photography and have been inspired to pass on the learning and skills I have developed to other people. Whether you are a novice or a more experienced photographer looking to develop your skills. Why don’t you come and learn more about photography in the beautiful countryside of Staffordshire. The course will cover the following areas: •	The basic settings of digital cameras - which ones to use and which not to! •	Photographic composition – the rules to follow and the rules to break! •	Shutter Speeds & Exposure. How these influence the results you get. •	Controlling ambient light & the use of the flash The course includes a photographic session in local woodlands (weather permitting), the Hen Barn & with the horseswhere you will have the opportunity to put into practice the skills from the course. Tea & Cake at the end plus a goody bag with course notes to take home. The course is held outside so please come dressed for the Great British weather & with good footwear as the farm and footpaths are muddy. You will need to have good mobility. Hello we are the Peaches, we have been keeping hens in our mark one eglu for over 10 years and have classics, go's & a Cube. We live in a small village, just outside Burton on Trent. We had always wanted to keep hens, but it wasn't until we saw the eglu and thought 'we have to have one of them!' The hens are really fun animals to be around and each one has its own personality and character. They are very friendly - our 10 year old is very happy to cuddle with them. The hens keep us very well stocked with the freshest, tastiest eggs in the world! During the course we will show you how to handle the hens, plus how to maintain your eglu (ours is over 10 years old and looking as good as new!) looking after the run (ours has survived having a horse sit on it!) plus our daily routines and health checks. From our humble start with our first 2 girls, Barbara and Margo we have now set up our business, 'Hens for Hire' hiring out hens and eglus to schools all over the country as well as incubators and hatching eggs. 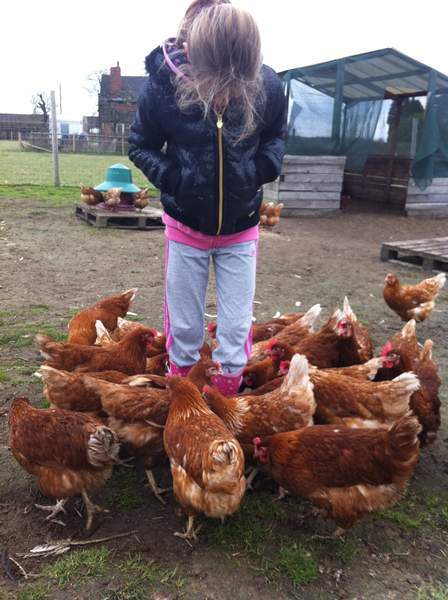 We train the staff how to look after the hens and spend time with the children talking all things chicken! then have the hens home for the holidays. Check out our website www.hensforhire.co.uk You can now pruchase chickens and supplies from our little shop Hen Pen, follow us on facebook for details of hens we have available. We have been invloved in Open Farm Sunday and been featured in The Guardian, Country Life, Country Living, Your Chicken, Staffordshire Life, The Burton Mail, Headteacher Update Magazine, EarlyYears Educator & Poultry World, plus been Course Host of the Month in the Omlet Newsletter in 2010. 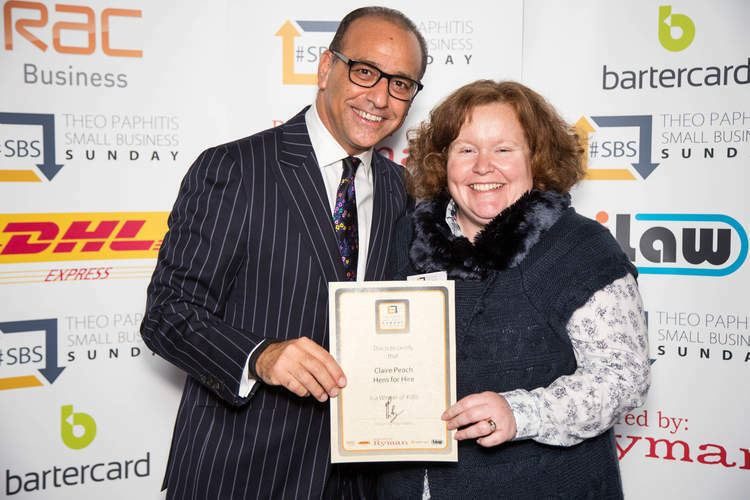 We also won a Small Business Award from TV Dragon Theo Paphitis! It was lovely to meet Claire and Steve who are such a chicken loving couple! They have further excited me whilst I look forward to getting my chickens something I am postponing til after our holiday in April. I have the Eglu poised ready and feel a lot more confident about dealing with the lovelies once they arrive. It was useful to gain further info from them on resources to use to help in the hobby as well as talking through what else I need to buy in readiness. Two hours well spent. Thank you Claire and Steve for the opportunity. Thoroughly recommend Claire's course. Loads of info, and very friendly intro into keeping chucks. If you are thinking of keeping chickens go on Claire's course, you won't be disappointed. And the cakes pretty good as well! Very professional , friendly and welcoming. Very informative relevant information. Would recommend to others. After this course we felt completely ready to collect our chickens. Cleverly got my son over his slight nervousness too - hug a chicken!